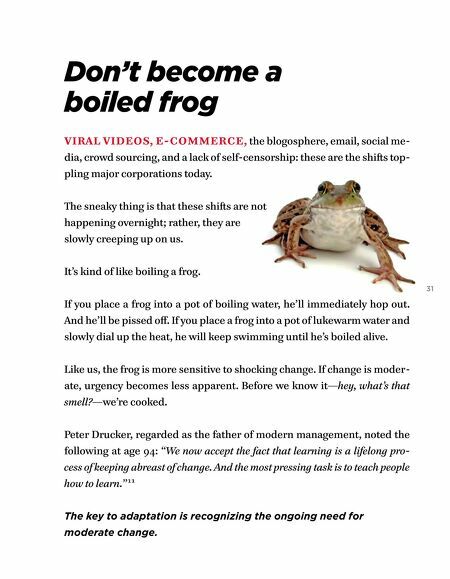 Don't become a boiled frog VIRAL VIDEOS, E-COMMERCE, the blogosphere, email, social me- dia, crowd sourcing, and a lack of self-censorship: these are the shiſts top- pling major corporations today. The sneaky thing is that these shiſts are not happening overnight; rather, they are slowly creeping up on us. It's kind of like boiling a frog. 31 If you place a frog into a pot of boiling water, he'll immediately hop out. And he'll be pissed off. If you place a frog into a pot of lukewarm water and slowly dial up the heat, he will keep swimming until he's boiled alive. Like us, the frog is more sensitive to shocking change. If change is moder- ate, urgency becomes less apparent. Before we know it—hey, what's that smell?—we're cooked. 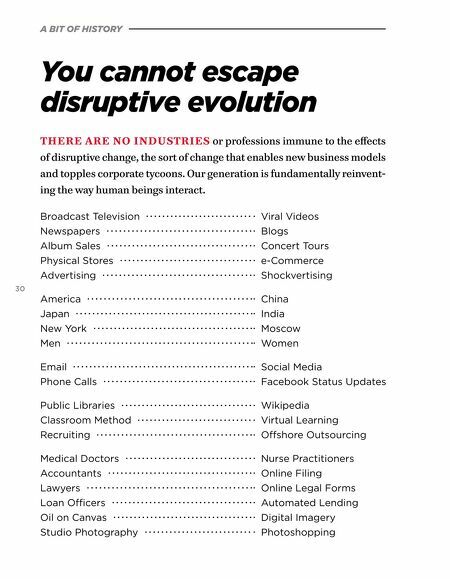 Peter Drucker, regarded as the father of modern management, noted the following at age 94: "We now accept the fact that learning is a lifelong pro- cess of keeping abreast of change. And the most pressing task is to teach people how to learn. "11 The key to adaptation is recognizing the ongoing need for moderate change.